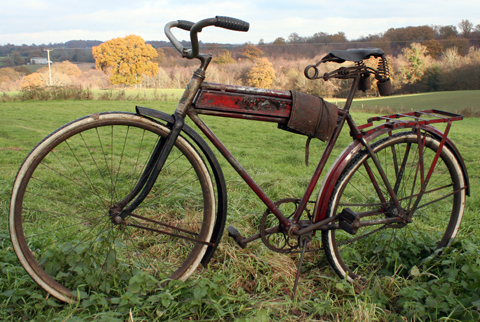 The ‘Motorbike’ style of bicycle took off in America in the 1910s at the same time as powered motorcycles. With their dummy tanks, they were designed to look like real motorcycles. 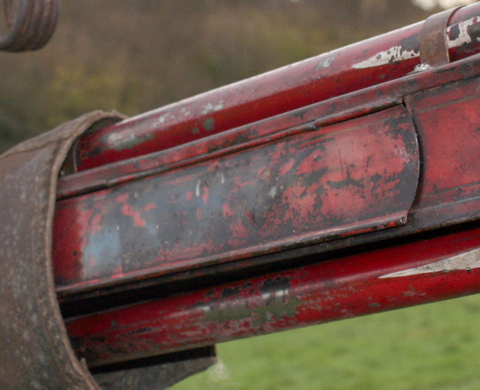 The ‘tank’ is actually a toolbox, with an opening flap on one side (below). 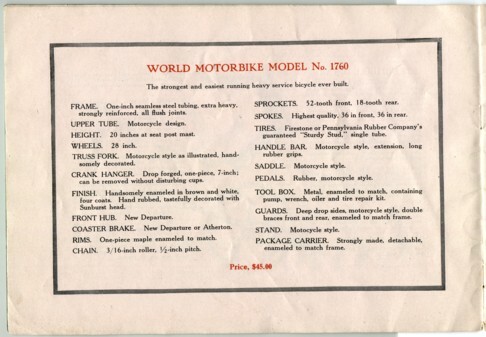 Top American manufacturers such as Harley Davidson, Indian, Excelsior, etc sold these ‘motorbikes’ (also sometimes called ‘motobikes’) alongside their regular motorcycles. Many were made by third-party companies such as Davis, and badged accordingly as they left the factory. 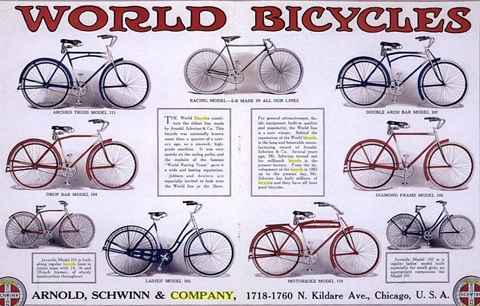 While other cycle manufacturers diversified into motorcycle and car production, Schwinn’s cycle division expanded rapidly. 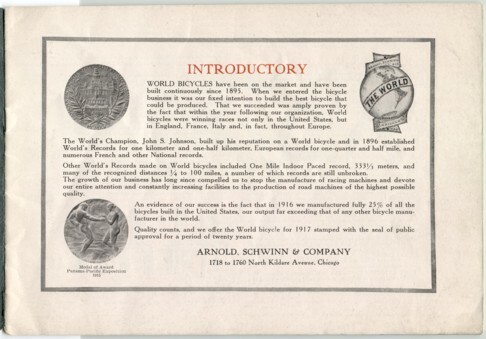 Schwinn bought Henderson to give the company a top motorcycle division, and also continued to dominate the bicycle market, with dozens of different badges, many reflecting the companies they’d taken over since the 1890s. 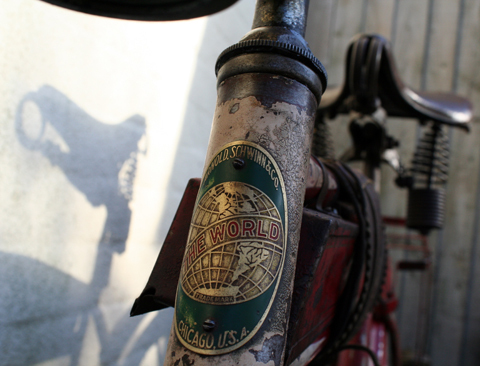 ‘The World’ was a range of bicycle they’d produced since before the turn of the century. 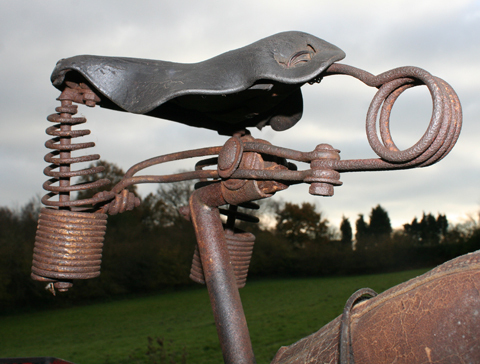 By the way, the leather thing wrapped around the tank is a gaiter, often worn around the ankle on the chain side of a bicycle with exposed chain to prevent your trousers getting dirty. 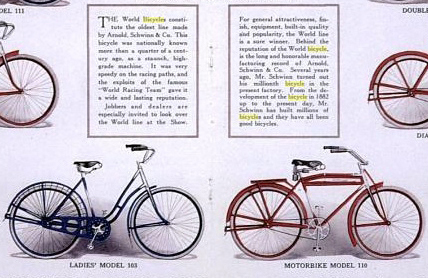 Above is the 1917 Schwinn World Motorbike, and below is the 1932 version. I’m not sure of the age of mine (company records don’t exist for this era). 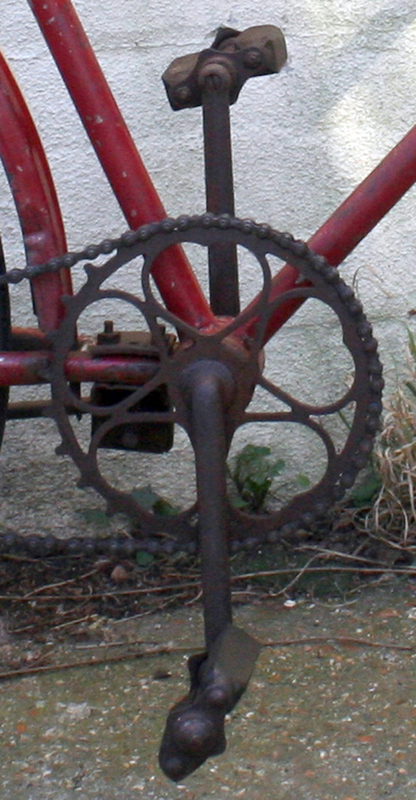 It has the later style of chainwheel, so I assume it’s closer to the 1932 model, probably late twenties. 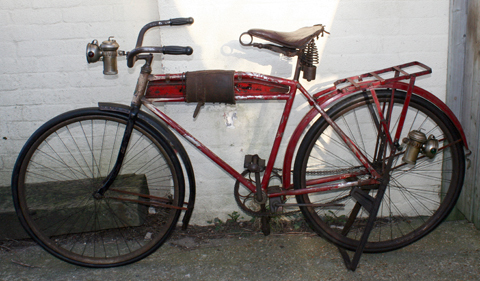 In Great Britain, lightweight bicycles became the ‘new classics’ in the thirties. 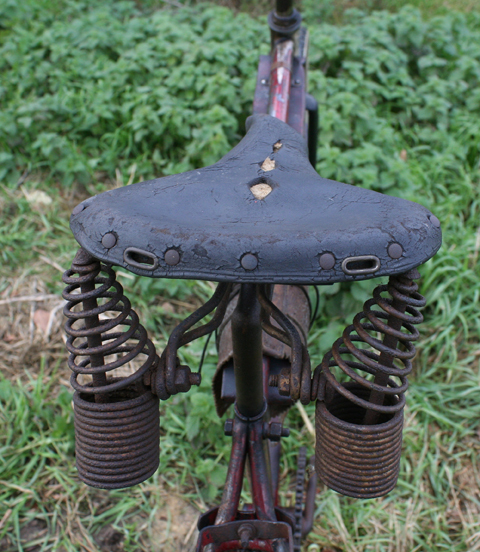 In similar fashion, in America the 28-inch wheeled ‘motorbike’ of the 1910s and 1920s was superseded by the aerodynamic 26-inch wheeled ‘balloon tyre’ bike. Of course, the style of the motorcycles that they reflected had also changed by the thirties. So this design became obsolete quite quickly …although now, fortunately, eighty or ninety years on, new generations are discovering these original designs once again. The teens and twenties are approaching their centenary, and it’s interesting to be able to ride a machine that’s a hundred years old. 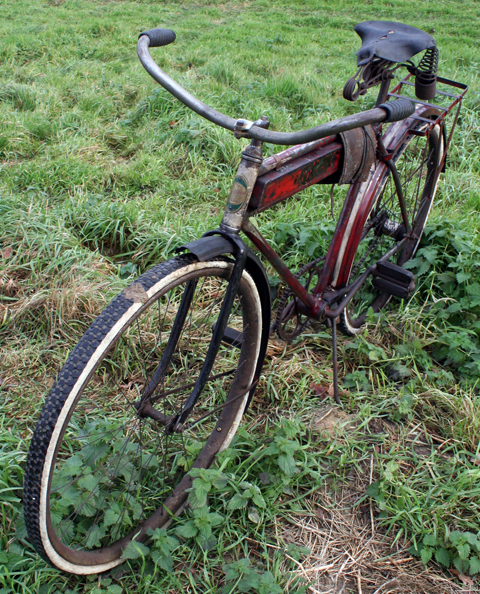 The 1932 Schwinn Motorbike with 28 inch wheels was the last of its kind. 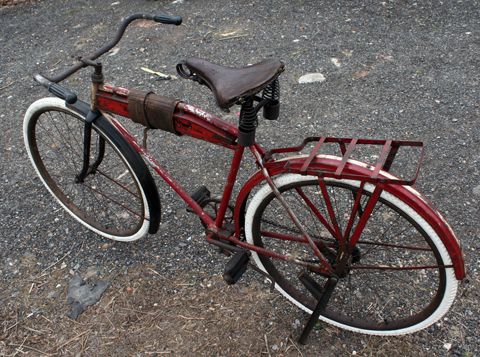 In 1933, Schwinn totally revolutionized the bicycle industry by introducing a new concept – the ‘balloon tire’ bicycle. 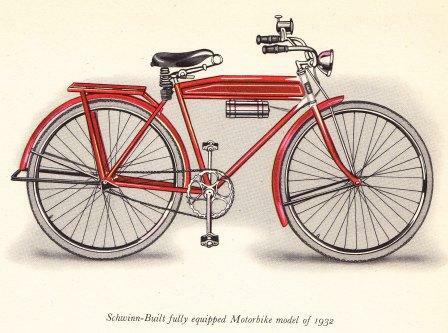 As you can see from the illustration below, the 1933 Schwinn ‘Model B Motor Bike’ looks very similar to its predecessor, even though the old 28-inch glue-on tyres were replaced by 26-inch tyres fitted with separate replaceable inner tubes. 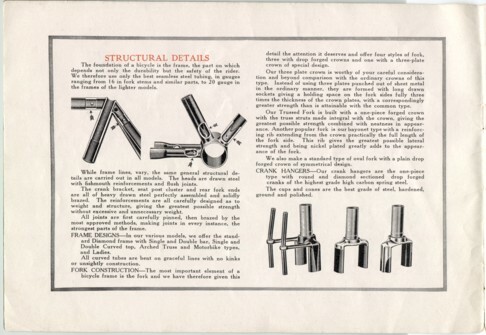 But within a year, new streamlined models were available (below), and post-1933 balloon tire design now represents the ‘classic look’ of vintage Schwinns. The styling revolution of the thirties produced many aerodynamic designs. So these early motorbike models with 28″ tyres – their look so reminiscent of the earliest powered motorcycles – are now the ‘dinosaurs’ of classic American bicycles. 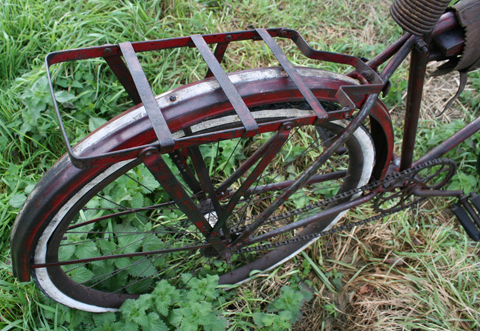 Though, in America, vintage bicycles are traditionally restored (usually over-restored), true enthusiasts in this country much prefer original paint. I suppose that, while Americans drove flashy new chrome-laden gigantic automobiles, we drove beaten-up little second-hand Austin Sevens. That vintage tradition seems to have survived. 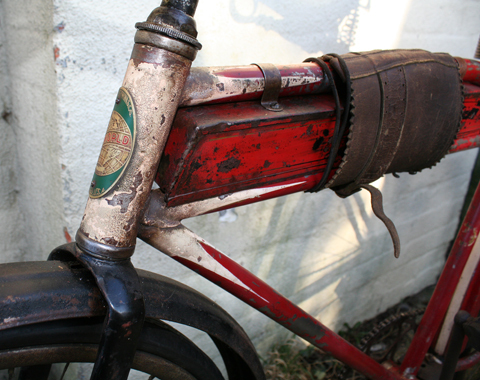 Because, these days, when we buy our vintage bicycles, we painstakingly rub away at overpaint on our bikes so we can experience the joy of revealing the original paint underneath. 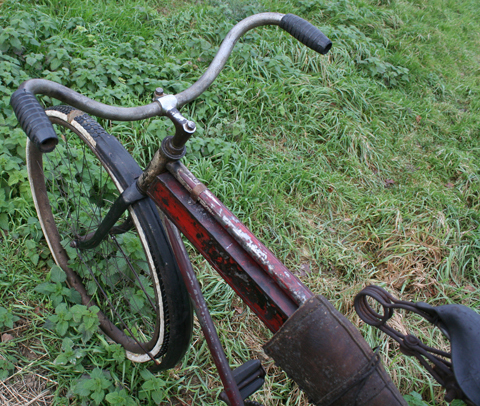 This Schwinn is mechanically functional, except for its wheels and tyres. 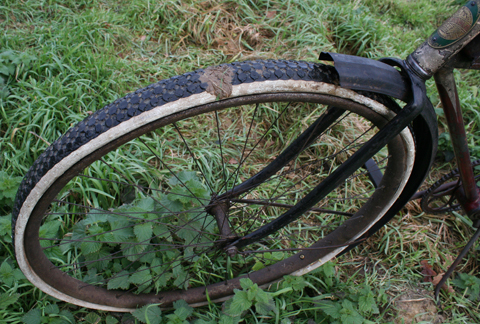 The original ‘tubular’ tyres need replacing. 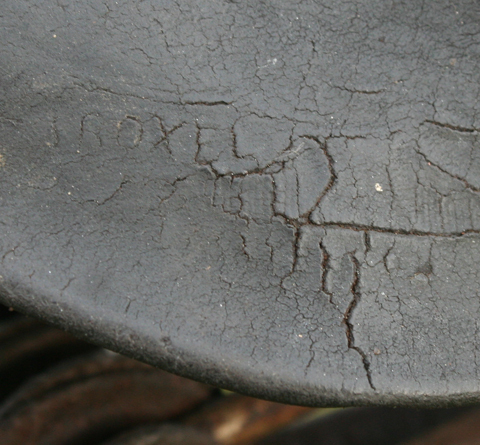 And the metal-capped wooden wheels have also seen better days. The simplest solution would be to replace them with more common 26″ wheels and tyres. 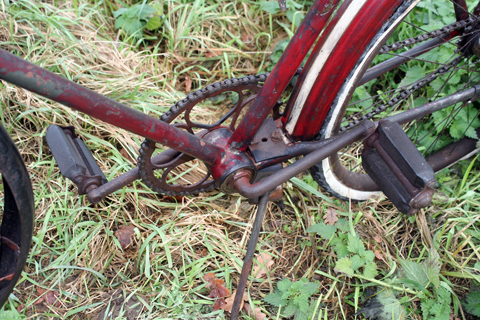 When I bought this Schwinn, the red paint that you see on the bike had been over-painted with black. 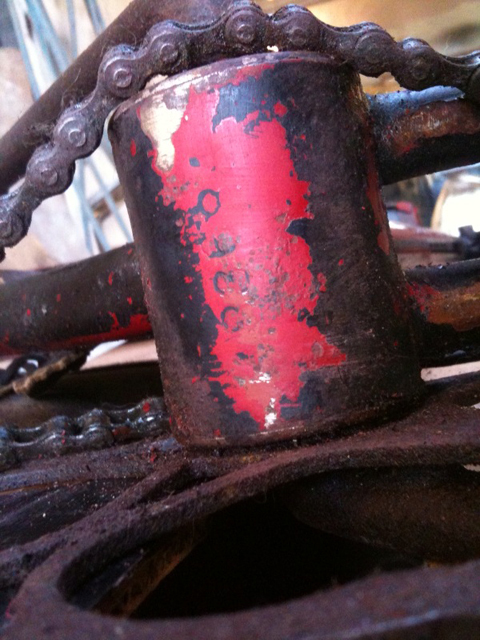 It took quite a lot of work to remove it – and in places it went down to bare metal – but the effort was worthwhile as you can now see its original colour. 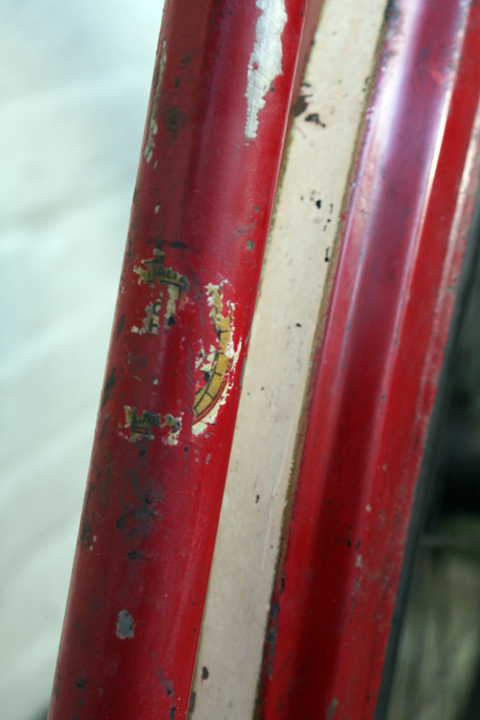 Below you can see a particularly interesting result of the paint stripping – the remains of an original decal on the down-tube. 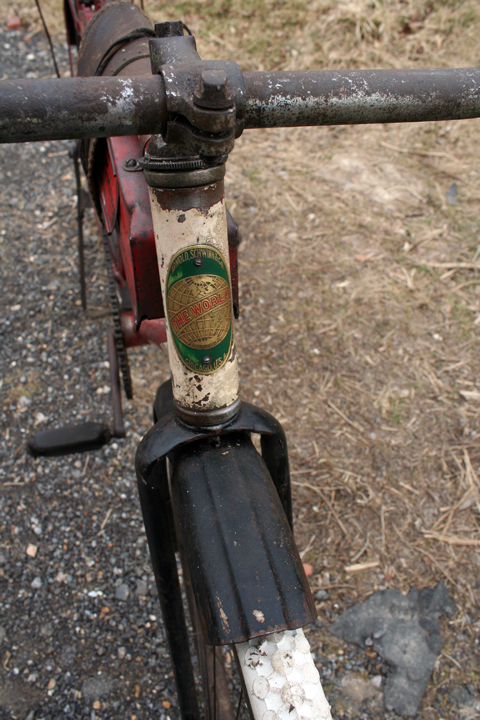 The rear mudguard responded better to the paint-removal than the frame. It clearly shows the original red colour. I initially thought that this bike was a 1917 model. But having now discovered that the paint is red, and comparing the ‘sweet heart’ sprocket (so called because of its heart pattern) with other catalogues, I now realize that it’s most likely from the late twenties. 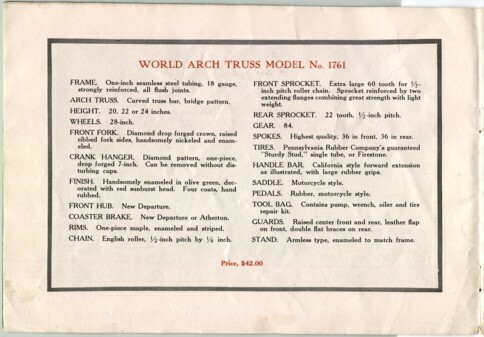 This is the 1917 catalogue. As you can see, the style stayed the same until the 1930s. 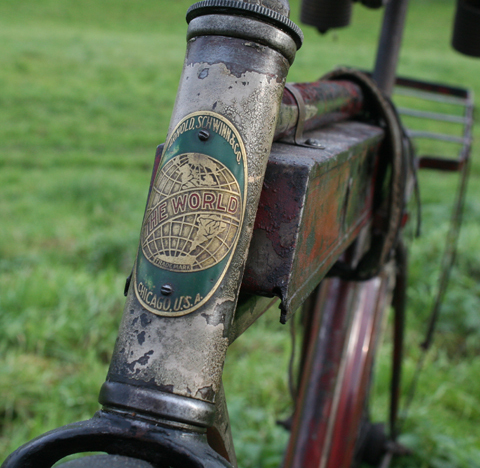 Ingaz Schwinn was a machinist who made components for high wheelers. He realized the potential of the new ‘safety bicycles’ and, in 1889, he managed to persuade a local German bicycle manufacturer Kleyer Bicycle Works to build bicycles of his own design. 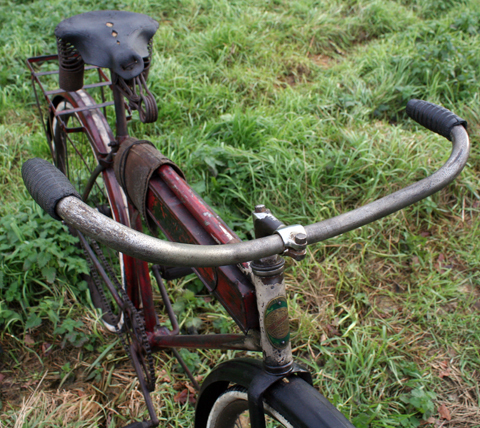 Schwinn’s bike was a success and he planned and built a new factory. Two years later, aged 31, he emigrated to the USA. 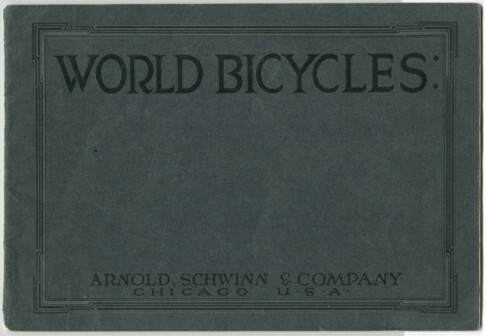 After working for Hill Cycle Manufacturing Co of Chicago, and then building a bike factory for International Mfg Co, he met Adolph Arnold, in 1894. 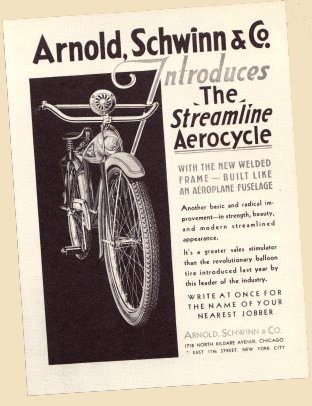 Arnold was a German investor who recognized the potential of the new bicycle craze and the new company Arnold Schwinn & Co was incorporated a year later. 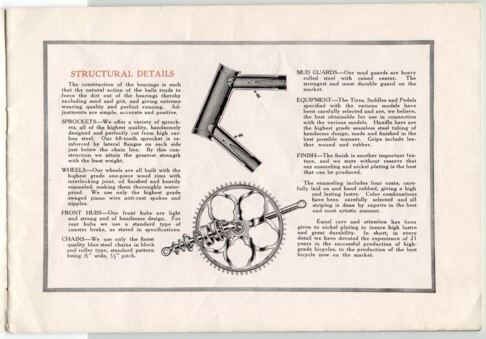 Schwinn knew the market very well, and was soon not only making some the best bicycles on the market, but also providing a model in each price range and in each area of the market. 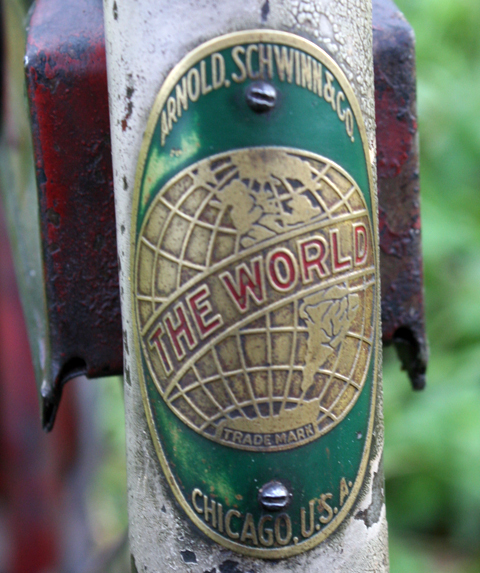 Most of the manufacturers, like Schwinn, were based around Chicago. 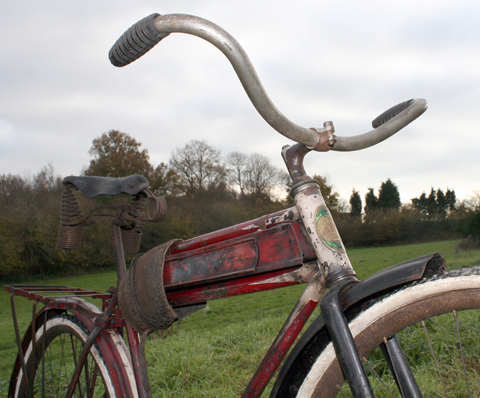 With the advent of the car in the early years of the twentieth century, the bicycle boom was over. In 1908 Adolph Arnold left the company. 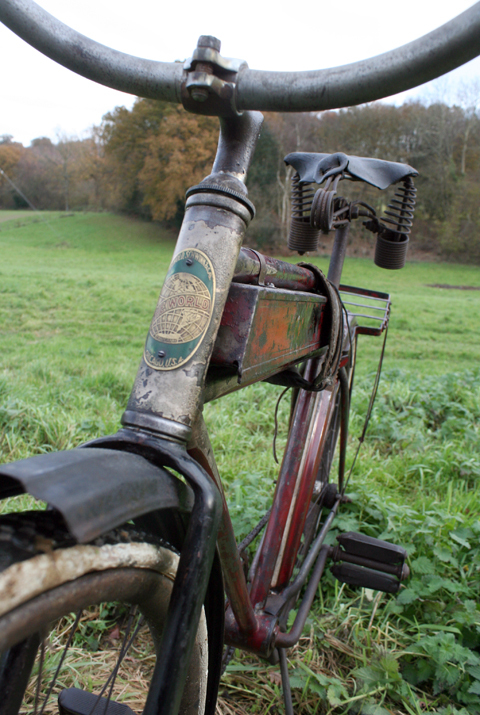 Many bicycle manufacturers went bust or sold their businesses and, from a peak of 300 bike makers in the height of the boom years, only a dozen or so remained. This does not include, of course, all the small companies that were swallowed up by the conglomerates such as Pope. 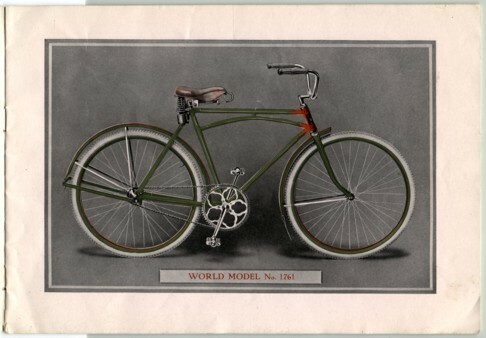 With their factories, labour and distribution networks, well-established bicycle manufacturers were in a good position to move into car and motorcycle production. 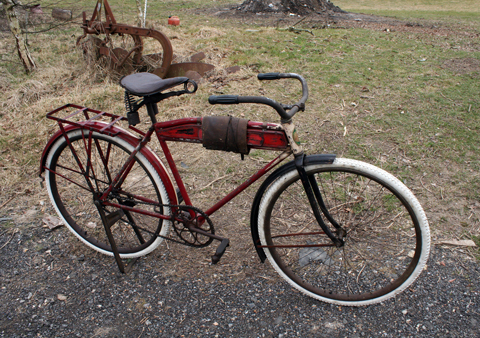 Schwinn experimented with ‘horseless carriages’ as well as motorcycles. 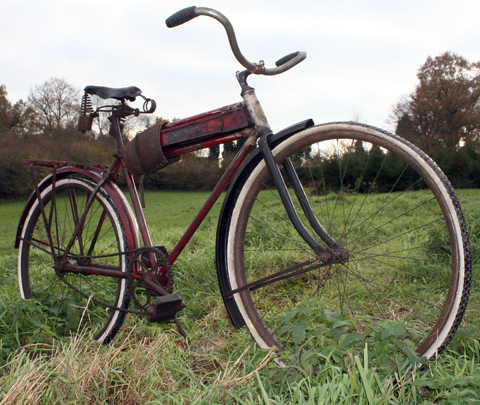 In 1911, Excelsior went bankrupt and Schwinn bought the company for half a million dollars. He built up the motorcycle side of the business and, in 1914, established the largest motorcycle factory in the world in the centre of Chicago. In 1917, when Henderson had been added to the Schwinn roster, the company became America’s third largest motorcycle producer. 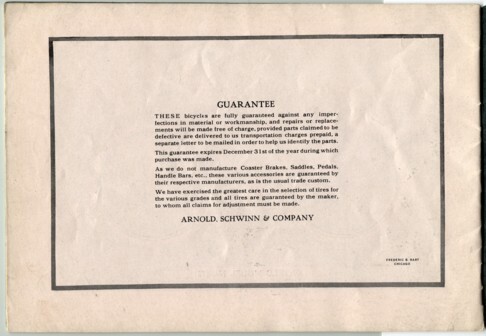 Schwinn bicycle production still existed, but was no longer the company’s main priority. In fact, bicycles did not become a company priority again until after Ignaz semi-retired in 1931 and his son Frank took over as vice president. 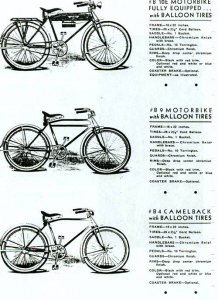 In collectors’ circles, ‘Balloon Tire Bicycles’ are now considered a separate genre that started in 1933. 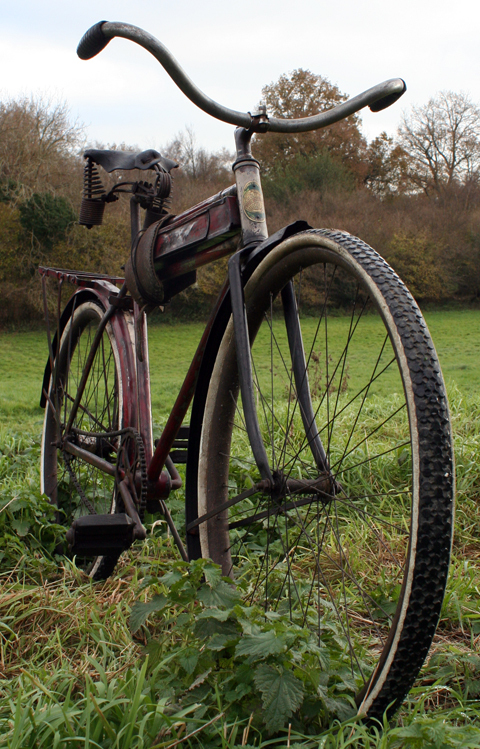 The new 26 inch balloon tyres were wider than the 28 inch tyres previously used on bicycles, and they were the first to be fitted with inner tubes. 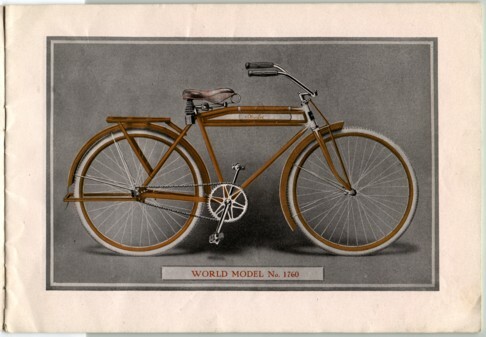 But bicycles at that time also underwent a styling revolution, with each company creating increasingly stylish streamlined designs that mirrored the railway trains, Greyhound buses, and the most luxurious automobiles of the era. 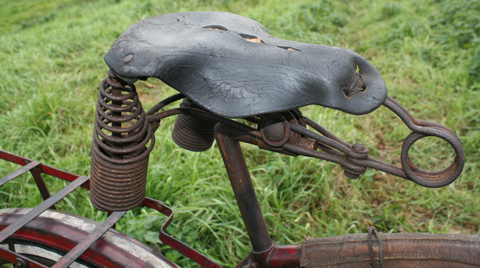 The heavy duty saddle is the same style as fitted to early motorcycles. 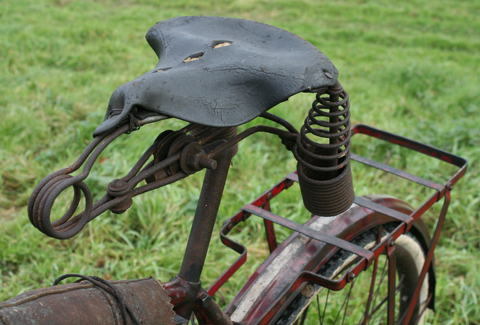 The front of the saddle is secured to the frame by wire.